The 2014 Camaro Z/28 had a problem spinning its tires. Not doing traditional burnouts, mind, the rubber was actually rotating on the wheels. Well it did, until Chevrolet engineers noticed the vibration that it caused and fixed the flaw. Chevy observed the issue while it was running laps of the Z/28 on a track. It claims that the Camaro's aggressive Pirelli P Zero Trofeo R tires and were generating so much traction that under braking, the rubber was actually slipping on their wheels. The engineers say that the car can develop 1.5 g of force under deceleration thanks to its Brembo carbon-ceramic brake rotors. They initially suspected an issue with the tires or wheels, and the test was relatively simple. The engineers marked a chalk line relative to the valve stem and took the Camaro out for a lap. When it came back, they found that the Pirellis had rotated 360 degrees or more. Camaro Z/28 is so grippy GM had to find way to keep tires from slipping on wheels originally appeared on Autoblog on Thu, 13 Mar 2014 13:31:00 EST. Please see our terms for use of feeds. 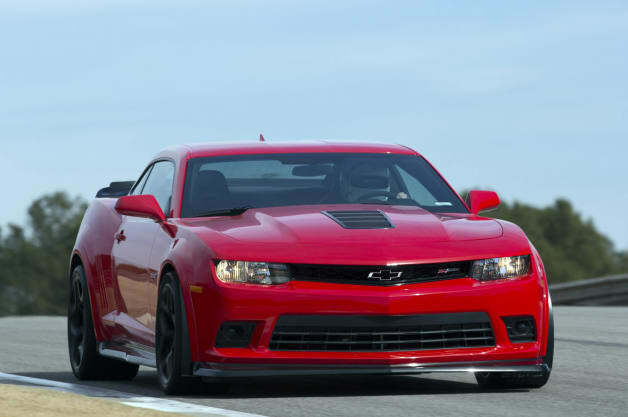 Pirelli P Zero Trofeo R tires, carbon-ceramic rotors push deceleration forces to 1.5 g.
DETROIT – While running fast laps at several of the country’s most challenging tracks, Camaro Z/28 engineers noticed the tires were providing so much traction and the brakes so much stopping force that the wheels rotated inside the tire – an unexpected challenge that required fast thinking. The suppliers included Pirelli and its P Zero™ Trofeo R tires and Brembo for carbon-ceramic brake rotors. The Trofeo R tires have a track-oriented tread design and compound that, together with the carbon-ceramic rotors, help the Z/28 achieve up to 1.5 g in deceleration force. It was a perfect combination, but engineers quickly found that when the Z/28’s capability was tested, the wheels were rotating – slipping – inside the tires. They sought the root of the problem by marking one of the Pirelli P Zero™ Trofeo R tires at the beginning of a lap with a chalk line relative to the valve stem on the wheel. At the end of the lap, they recorded where the chalk line ended up and noticed the tire had rotated at least a full 360 degrees from where they started. Racers use an abrasive paint around the bead of the wheel, where the tire meets the rim, to combat the problem on race cars. The Z/28’s engineers tried it, but it wasn’t strong enough to prevent the slippage, so other approaches were tried. Finally, they tried media blasting, which involves shooting a gritty material through an air gun at the wheel’s surface, adding texture to the paint for the tire to grip. “Media-blasting the wheel created an extremely aggressive grit on the rim, which finally got the tire to hold,” said Stielow. Along with the tires and brakes, some of the tire slip can also be attributed to the 7.0L LS7 engine helping spin the wheels with an SAE-certified 505 horsepower (376 kW) and 481 lb-ft of torque (652 Nm). While going around corners, the helical-gear limited-slip rear differential also sends power to the wheels so well that differences in tire slip can be observed from side to side on the rear axle. 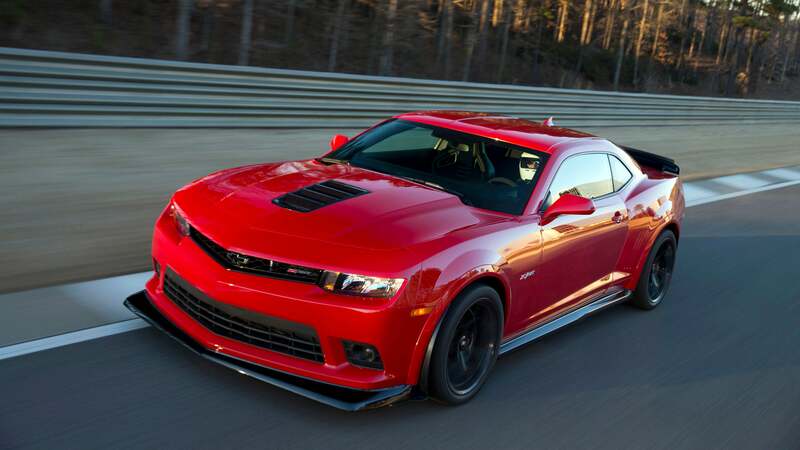 The 2014 Camaro Z/28 arrives in dealerships this spring. In an unexpected turn of events, the Camaro Z/28's engineers noticed that the tires rotated at least a full 360 degrees on the rims during a single lap on the test track. Brembo's carbon-ceramic brake rotors can do that to you.